Often also called “traditional braces,” metal braces have two basic components. These are the metal bracket that is applied to the teeth and the bendable metal wire that is threaded through the brackets in order to apply pressure to the teeth and ultimately move them. 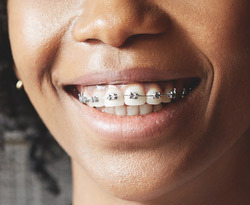 This is the type of braces that most teenagers get, because they are the least expensive version and are often the fastest way of moving teeth into their ideal locations. In the past, the brackets and wires used for metal braces were very noticeable and could be annoying to those who wore them because of their size and intrusiveness. Today’s metal braces are smaller, more comfortable and less noticeable than traditional brackets. Ceramic braces were once a very popular alternative to metal braces. Ceramic braces are made of clear materials and are therefore less visible on your teeth than metal braces. For this reason, ceramic braces are used mainly on teenage and adult patients who have aesthetic concerns. While they are visually less prominent, they do require more attention to oral hygiene since ceramic braces are larger. The only drawback to ceramic brackets is that they are more fragile and the elastic ties can discolor between orthodontic visits with certain foods and smoking. 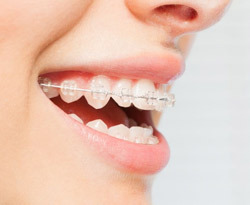 Essentially the exact same as metal braces, except that they are on the inside of the bite, instead of on the outside, lingual braces provide a number of benefits. They can be just as effective as traditionally placed braces, whether of metal or ceramic, but they cannot be seen from outside of the mouth. While they can be spotted when the wearer opens their mouth, they are far less intrusive and likely to be noticed than brackets and wires on the front of the teeth. Lingual braces come along with a number of negatives that make them an inappropriate choice for many patients. They can be very difficult to keep clean, as the wearer cannot see the braces, nor is he used to cleaning the area that he now has to clean extensively. They can also make it difficult to talk. Like all orthodontic treatments, there is a learning curve for speech, but lingual braces are often more difficult than other types of braces. Lingual braces are also not a good option for those that have severe orthodontic conditions that need extensive treatment. And because they take longer and are often more expensive than traditional braces, most patients do not opt for this type of treatment. Similar to traditional metal and ceramic braces, self-ligating braces make use of the bracket and wire system. This may be the type of braces that most orthodontist use today, but many still use a more traditional system. 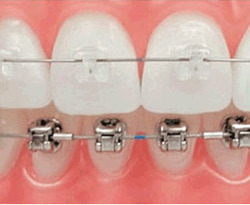 This type of braces uses brackets with clips or doors that hold on to the wire, instead of the rubber band tie system. These braces are supposed to hold on to less food and be less painful than other types of braces, and they are also supposed to reduce the number of trips to the orthodontist the patient has to make. 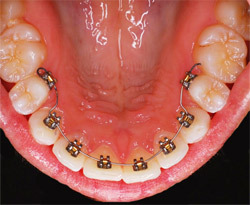 This type of braces can be found in both metal and ceramic versions, but they are not the right choice for every patient. While they do shorten treatment periods, they might not provide all of the features that a patient needs in order to have a successful orthodontic treatment. The Invisalign system is a series of clear overlay templates, called aligners, that have been generated by computer simulation to gradually move teeth. This system is available to adult patients and some teenagers with certain orthodontic bite problems. Ask us if you are a candidate for the Invisalign system. PreviousPrevious post:These two are all smiles!NextNext post:What type of braces work the fastest? We had a busy week …. How can you get free aligners? Excellent service . Staff was friendly and very helpful. We received superior customer service from our clinical assistant. She was courteous and communicated well with my daughter. She also explained to me what was done during the check up and had a pleasant and upbeat attitude. This was so much better than our last visit with Samantha. Straight your teeth, faster and cheap. Subscribe and receive 5 case study.